It's not the 23 fighting majors Jared Boll has this season that has Ken Hitchcock gushing over the rugged rookie. The Columbus Blue Jackets conservative coach even said he could have done without a few of them, "especially the ones that are staged." It's also not the effort and energy Boll squeezes out of his 6-foot-2, 210-pound body on a daily basis that has Hitchcock singing the rugged right wing's praises. "The amazing part for me is he's been able to stay healthy," Hitchcock said. Watch Boll play for just one period and you'll understand what the coach means. 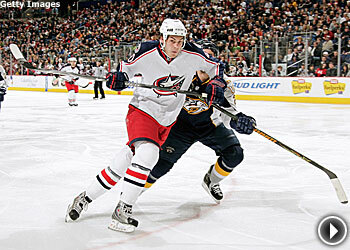 Boll, who was aptly described in the Columbus Dispatch this season as "a half-grown Labrador retriever set loose at a dinner party," is one of the most reckless players in the NHL, yet he's been ultra-effective for the Blue Jackets and has astonishingly missed only four games all season, including three as he battled bronchitis. Without him from Feb. 13-17, the Blue Jackets went 1-2 and were lacking that extra punch. "He throws his body around like a bowling ball," Hitchcock said. "He has no regard for his body. He obviously brings an unbelievable energy level to our team. Our team is different without him." Boll takes the compliment to heart. He's surpassed great odds to earn it. A year ago at this time, Boll was playing with the Plymouth Whalers in the Ontario Hockey League, hoping to sign a contract with the Blue Jackets and get a shot at making a statement in the AHL this season. "I went to camp and all I could think of was making the team and playing in the NHL," said Boll, Columbus' fourth-round pick in the 2005 Entry Draft. "I put it in my head that is what I'm going to do, and I had a good camp." Boll, though, knew he had to stand out. He did so the only way he knew how. He fought three times in the preseason. "I was blending in with all the guys in camp," Boll said. "So, I figured if I ran around a bit and fought I'd get noticed." Despite registering only five goals and four assists this season and spending 202 minutes in the penalty box, second-most in the NHL, Boll has been one of the Jackets most effective players. Hitchcock thinks so highly of him that he believes Boll will eventually develop into a 20-goal, 40-point player in the NHL, the ideal third-line energy guy. Boll scored 47 goals and assisted on 49 others in 131 OHL games. He had 29 goals and 32 assists in 116 USHL games with the Lincoln Stars. He also combined for 873 penalty minutes in his junior career. "He's got some offensive instincts that are great, but I don't think you'll see those things for a year or two," Hitchcock said. "Those will be the last part of his game to catch up. That's just going to take time because this is the NHL and NHL players, especially defensemen, they know how to squeeze you off and they know how to defend one-on-one. He's not going to get away with the things at this level that he was able to get away with in junior. It's almost like re-learning how to score." Boll is aware this has to happen. He won't survive in the NHL for many more years if he remains only a reckless right wing. He needs to provide at least some semblance of offense, especially if he comes with a history of it already. "You have to be able to play if you're going to fight," Boll said. "I think that is the last part of my game that will come, and it comes with time and getting more confidence on the ice and patience with the puck." Of course, that means staying out of the penalty box, which will require Boll to tone his act down a bit when he's on the ice. "Definitely it's not fun sitting in the box for five minutes each game," said Boll, who would indeed play more than the roughly eight minutes per game he does now if it weren't for his penchant for fisticuffs. "I'll tone it down a bit, but right now this is what they need me to do." Hitchcock doesn't see Boll turning over a new leaf any time soon, and he's OK with it as long as Boll recognizes who he should fight and who he shouldn't. For instance, fights against Dustin Byfuglien (6-3, 265) and Doug Murray (6-3, 240) are not the kind that Hitchcock endorses. He's giving up too much to his opponent. Fights against Aaron Downey (6-0, 200), Daniel Carcillo (5-11, 190) and Travis Moen (6-2, 210) are OK. It should come as no surprise that Boll has fought them all this season, and doesn't regret a single one. "He's a gamer, but he's not a heavyweight," Hitchcock said. "I don't like it when he's going up against a guy and he's giving 30 or more pounds away. I don't like that. I don't think it's fair. Those are the only ones that make me a little nervous." Not enough to make the conservative coach stress over them. Hitchcock's blood pressure will rise only if Boll gets injured in one of them.